I love a lie in on a Saturday morning, but this last Saturday we found ourselves heading down the highway at 06h45 in order to get to Durban in time for our first ever Park Run which started at 08h00. What a great event … A free 5km time trial that happens every Saturday with the route starting on the promenade outside Suncoast Casino and making its way past Circus Circus Beach Cafe for 2.5kms before heading back to Suncoast. We really enjoyed it but let’s face it, every runner, elite or not, deserves a good breakfast after a 6h15 wake up call and this really was why we had made the trek from Kearsney! I’d heard a fair amount about The Corner Cafe in Glenwood and we decided to give that a try. 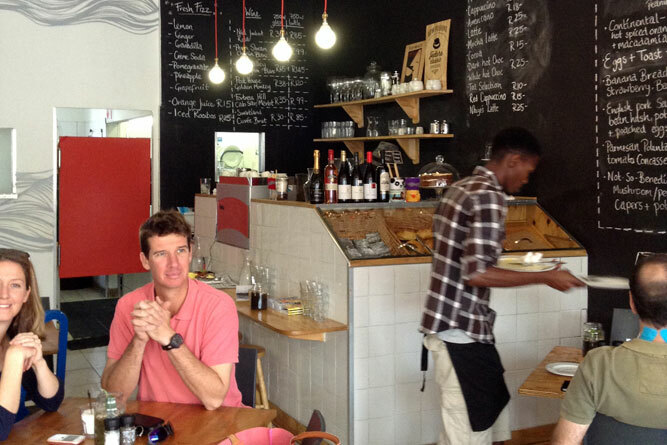 We made our way from Durban North but on arrival at our destination were told by the owner of the cafe that we would have to wait at least 45 minutes just for a table, let alone food of any sort and on his recommendation made our way to Parc Cafe instead. Wow – what a pleasant discovery! Located at 394 Esther Roberts Road Parc is a simple little spot; I didn’t even notice a sign of any sort announcing we were in the right place, it was only because the owner of The Corner Cafe had said it was next door to The Glenwood Bakery that we presumed we were! There are five or six tables on the pavement outside the shop (under cover thankfully because Durban summers are brutal) and as many indoors. We sat ourselves down at a table and were offered coffees almost straight away by our waitress … These did take a little while to arrive but were worth the wait (in fact I disposed of mine so quickly that I had to order another). There is a large selection of meals with both breakfast, lunch and a glass of wine provided for. 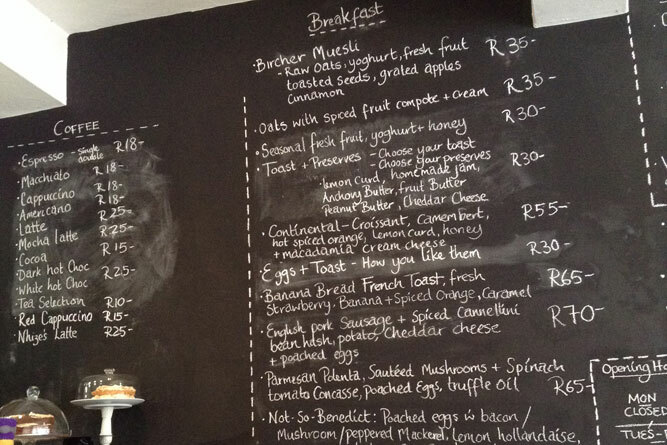 Breakfast options range from seasonal fruits with yoghurt and honey (R30) or oats with spiced fruit compote and cream (R35) to something more substantial like pork sausage with spiced cannelleni beans, potato and poached eggs (at R70 the most expensive dish on the breakfast menu). 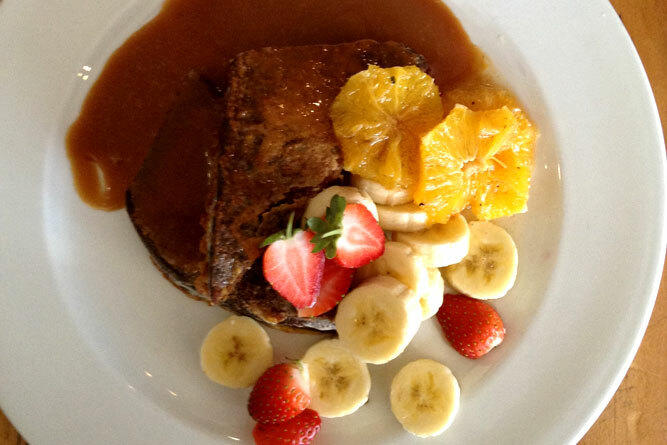 I felt like trying something completely different and chose the banana bread French toast served with fresh strawberries, banana and caramel. Oh my goodness, it was utterly heavenly and completely worth the R65 charged. 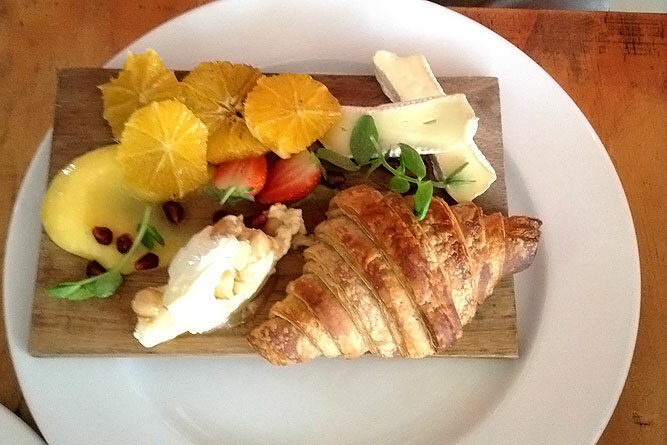 My husband went for the Continental breakfast which consisted of a croissant, spiced orange slices, lemon curd, Camembert and a honey and macadamia nut cream cheese. Presented on a wooden board it was a very pretty plate of food but he did find it very rich. My sister in law felt like eggs on toast and that was what she had … When ordering one has a choice of how the eggs should be cooked and also a choice of either rye, ciabatta or potato and rosemary breads. The bread choices apply to the open sandwiches on the lunch menu too. The lunch menu also looks tasty. There is a choice of three different salads, four options of open sandwiches and finally either chicken liver pâté served with artisanal breads and pickles, a soup of the day and a quiche of the day served with greens. We loved our breakkie at Parc … How apt that after the Park Run we ended up at Parc! We will have to make it a tradition, although there seems to be a number of places to discover in Glenwood. Opening hours for Parc are 07h30 to 16h00 Tuesdays to Fridays and 08h00 to 14h00 on both Saturdays and Sundays. They are closed on Monday. Table reservations cannot be made over weekends and public holidays.